Disclosure: Maverick sent me this thermometer to test; however, all opinions are my own. I do not accept payment or products in exchange for guaranteed positive reviews. Even the best chefs can ruin a meal by cooking “blind” and not knowing the internal temperatures of the dishes they are preparing. Don’t be fooled by rough guidelines. The look or the feel of a piece of meat can get you in the ballpark, but to produce the best results you need better than ballpark. When you need to know exact temperatures, you need to have a reliable thermometer; the Maverick Redi Check ET-733 is just that. I loved the idea of having a separate receiver with this unit, I think it offers some flexibility for those who don’t prefer using a smart device as a reciever. Many newer probe thermometers are moving to an app-based platform, which depends on a mobile device for remote reading. This isn’t a bad thing but not everyone wants to switch back and forth from whatever they are doing on their device to the app in order to check temps. So, a stand-alone receiver is a nice option. I found the range to be more than sufficient, allowing me to roam freely. In fact, the manufacturer claims 300 feet; I was consistantly able to achieve a little better than that during my tests which really added to the experience. Finally, if there’s one thing I appreciate, it’s simplicity. This is a very simple unit to operate once you become familiar with it. My two biggest concerns with this unit could easily be remedied. First, the supplied probe cords are only 3’ long, they really need to be about 6’ to provide more flexibility in terms of where the transmitter can be placed. Depending on your grill set up this may or may not be an issue. 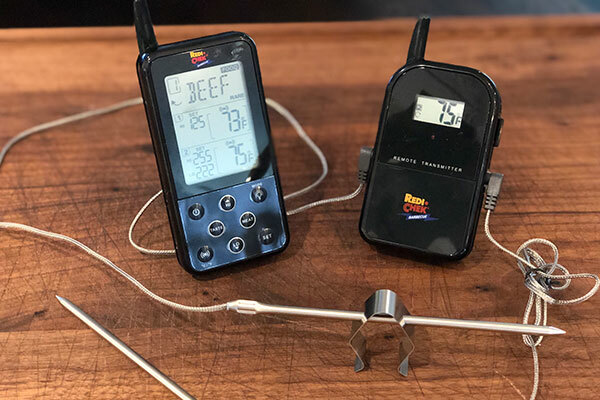 Every outdoor cook needs a great probe thermometer, but indoor cooks will appreciate this model too. The probe wires are thin enough to easily close a grill lid or an oven door on them without interruption, though the 3’ cords make oven usage difficult. I have found aftermarket cords that are much longer and also work well with the 733. I have no issues with recommending this unit — especially at its price point. It has been very dependable since I started testing it a couple of months ago. I would love to see this model come in four or even six channels. To be fair, Maverick does have a 4-channel model available that works very well. I will say the one question I ask myself when doing these reviews is: would I give this to a friend or family member as a gift and feel proud to do so? The answer for the Maverick ET-733 here is yes, I definitely would.